Thus far, we’ve completed the first ten letters of the alphabet. (Check out our previous “Who Dats”: Unknowns beginning with the Letter A, Letter B, two pages for Letter C (here and here), Letter D, Letter E, Letter F, Letter G, Letter H, Letter I and Letter J.) We even have one of buttons with pictures only — no names. That’s even harder to decipher. We’re returning to the alphabet — unknowns of the Letter K. Since we’ve put this particular display together, we think we have the answer to some of them (see descriptions below the photos). Can anyone help with the identification of these buttons? 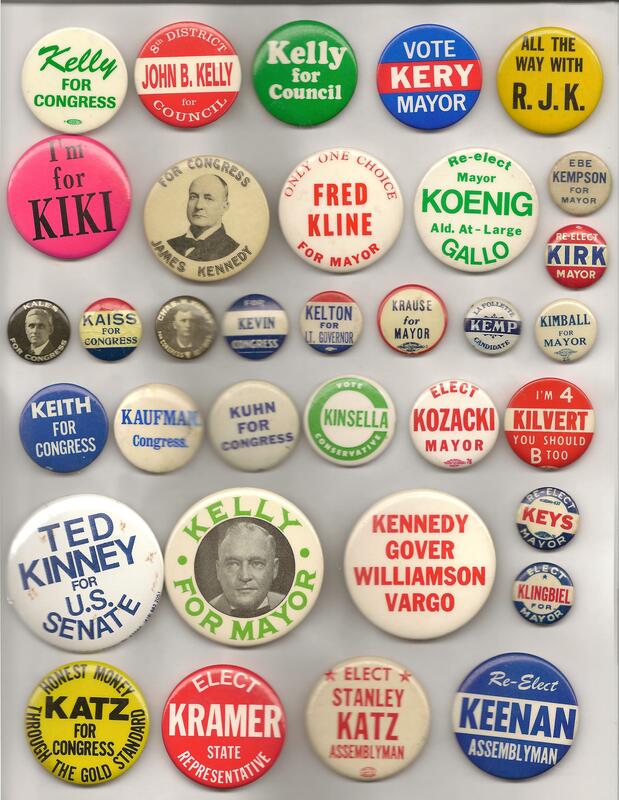 ROW 1: John B. Kelly for Council (second button in row) may be Philadelphia. ROW 2: Second button (James Kennedy for Congress) may be from Ohio. The Koenig/Gallo item (4th button) could be from Kingston, N.Y.
ROW 3: Third button reads, “Chas. H. Kunst for Congress/10th Dist.” This could be from Missouri. 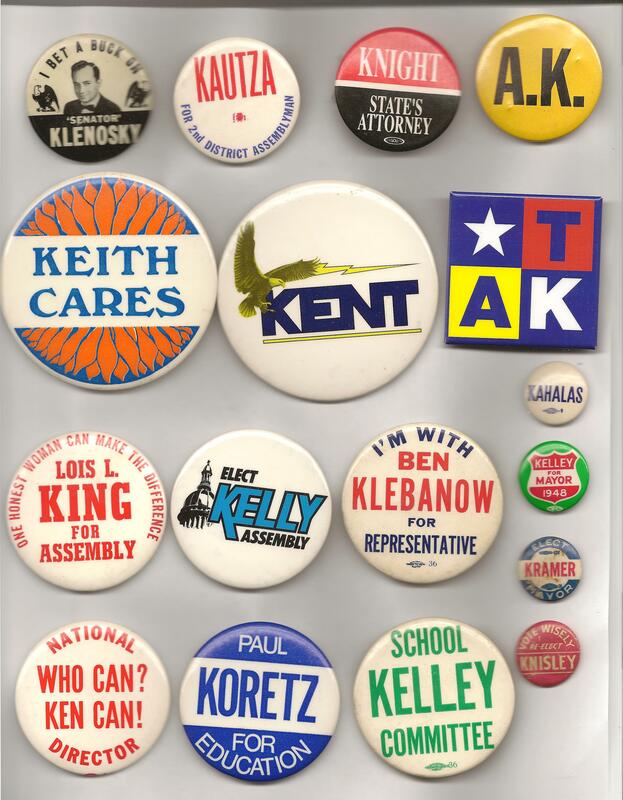 Love the 7th button in this row: “La Follette Candidate/Kemp.” But have no idea who it’s for or what La Follette. ROW 4: Kinsella (4th button) was the Conservative Party chair from Staten Island, but I don’t know what office this is for. ROW 5: Fifth button (“Ted Kinney for U.S. Senate”) has been identified as from North Carolina in 1986. ROW 1: First button (“Knopf for County Clerk”) may be from Chicago. Third button (“Arthur Kreinheder for Councilman”) is likely from Buffalo, N.Y. Fifth button (“Re-elect Chas. F. Kelley Dist. Attorney”) has been identified as from Philadelphia. 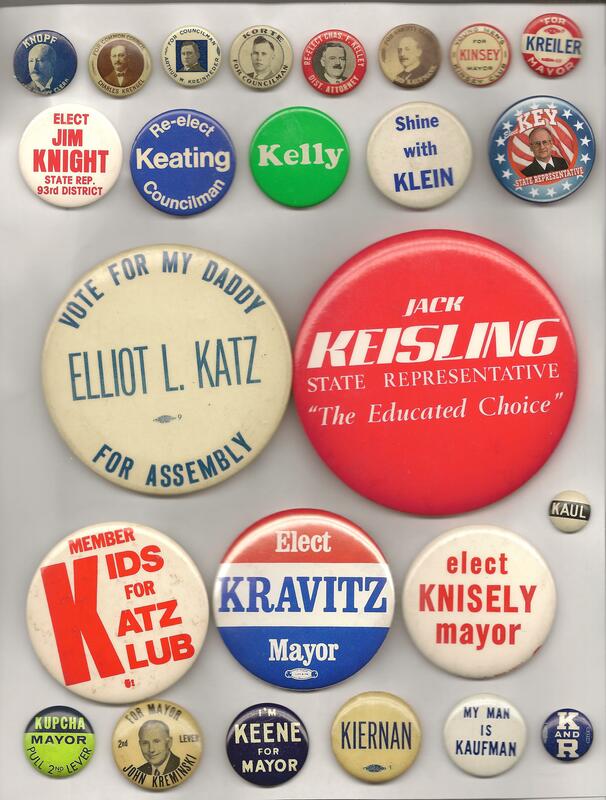 ROW 3: That large Elliot Katz for Assembly button is probably from New Jersey. That tiny “Kaul” button could be a Virginia congressional candidate that appears on a JFK coattail. ROW 5: “John Kreminski for Mayor” is likely to be from Meriden, Conn. The “Kent” button is actually Kent State University, and not a political campaign button. Likely from the early 1990’s. 1sr Page…5th row may also be John B. Kelly (Princess Grace’s father) who ran for Mayor in Philadelphia. Page 2 the Kent might be a sports button for the Kent State Golden Flashes and the TAK is from Alaska Tony Knowles. Page 1 Row 4: Possibly Hastings Keith (R-Mass) who served from 1959-1973. Looks like the style and type seen from that time and common in the greater Boston area. Page 3 Row 3: Benjamin Klebanow was a Democratic State Representative from the Dorchester section of the City of Boston and served in the Massachusetts House from 1961 to 1969. He died in 1971. This man was my great uncle! How fascinating! Thank you so much!